A medieval baker with his apprentice (scanned from The Medieval Cookbook by Maggie Black). between the eleventh and sixteenth centuries. Guilds are defined as associations of craftsmen and merchants formed to promote the economic interests of their members as well as to provide protection and mutual aid. As both business and social organizations, guilds were prolific throughout Europe between the eleventh and sixteenth centuries. A significant part of the skilled labor force in medieval cities was structured around the organization of guilds, which provided economic, educational, social and religious functions. The study of guilds provides opportunities for teaching several key economic concepts in a historical context, including specialization, division of labor, productivity, human capital (skills or education), monopoly power, economic systems, and labor unions. Although the organization and functions of guilds varied greatly across areas and across time, certain generalizations are possible. 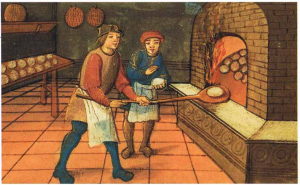 Guilds in medieval Europe could be classified into two types: craft guilds and merchant guilds. Craft guilds were made up of craftsmen and artisans in the same occupation, such as hatters, carpenters, bakers, blacksmiths, weavers and masons. Many craft guilds came about because the growing population in cities and towns led to increases in specialization and division of labor. Merchant guilds included most or all of the merchants in a town or city and were involved in regional and long-distance trade. Merchant guilds were also influential in local governments, and many leaders of merchant guilds were wealthy and influential citizens. The functions of craft guilds and merchant guilds sometimes overlapped when merchant guilds opened shops or craft guilds engaged in trade. Guilds existed in rural areas also, and these were often established largely for social and religious purposes. comparable to day laborers today. A master, or master craftsman, was a full guild member who could start his own business. To become a master, journeymen frequently had to produce a “masterpiece” to demonstrate their skill in their trade. If the masterpiece was accepted by guild members, they could vote to accept the journeyman as a master. It was an honor to be a master, and some were chosen to be inspectors or wardens to ensure that other guild members’ products were of a high standard. their skills. The specialization within a trade provided by the guild structure, along with the training and skills, led to increased productivity, increased wages, and higher standards of living. Guilds became a major source of employment for workers in cities, and guild membership was widespread. Guilds functioned as local monopolies. In classic monopolistic style, they sought to raise wages through increased profits by limiting the quantity of goods and services produced and by controlling prices. Guild membership was limited so as not to flood markets with products and cause prices to fall. In hard economic times when demand was low, fewer journeymen would become masters and fewer apprentices would become journeymen. When times were better and demand for goods and services was higher, promotions within guilds were more common. Guilds also controlled the quality of goods produced, realizing that it was in their self-interest as well as that of consumers to produce high quality products. Guilds relied on cooperation among their members to achieve their common goals, and low quality products were not tolerated because all guild members would suffer. important religious functions for their members. They worked to achieve eternal salvation for members by encouraging prayer for living and dead members, church attendance, and pious behavior. Figure 1: Year 1347 A.D.: The Rules of the Hatters of London. These rules are accepted by Thomas Leggy, Mayor of London at the request of the Hatters of London. Although written records about guilds from before the twelfth century are\rare, many documents survive from the fourteenth and fifteenth centuries and later. A somewhat simplified version of a source document from the Hatters’ Guild of London from 1347 is shown in Figure 1 (on p. 65). This document and others like it help to paint a picture of the role of guilds in the Middle Ages and the economic system that they helped to determine. 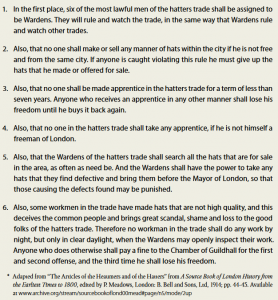 According to this short document, the mayor of London had the power to approve the guild’s rules, and he appears to have been in charge of punishing those who produced defective hats. 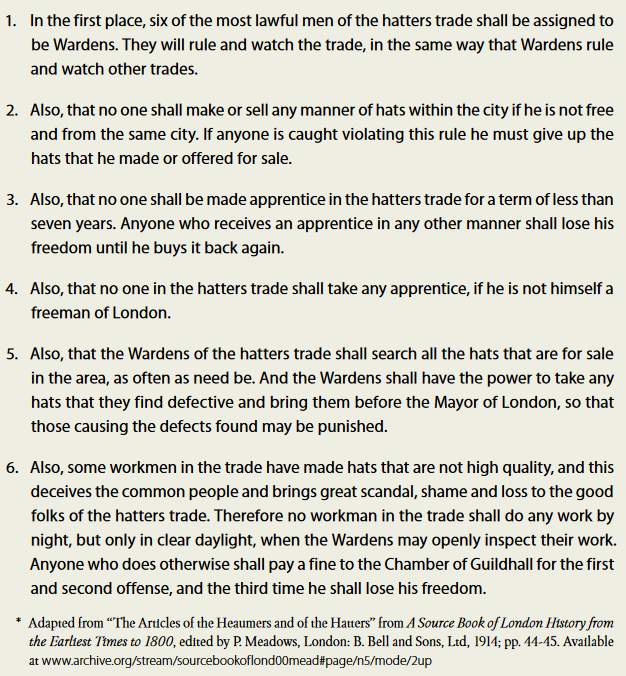 The most “lawful” men in the trade could become wardens, who examined the quality of hats and brought the defective ones before the mayor. An apprenticeship with the Hatters’ Guild lasted seven years. The workmen who did not make high-quality hats brought “great scandal, shame and loss” to others in the guild. Therefore, hats could only be made in daylight, when wardens could inspect the work. Defective hats had to be forfeited. Evidence is provided that everyone was not free in London in 1347, and that freedom could be lost for violating the rules of the guild. The decline of guilds after the sixteenth century took place for both economic and religious reasons. Industrialization and the existence of new markets greatly weakened the control of craft guilds. As societies moved from feudalism to emerging forms of capitalism, the monopolistic practices of guilds and the hereditary structure of many apprenticeships became outmoded. With industrialization, the structure and control of guilds were difficult to maintain. In addition, the Reformation resulted in the suppression of guilds in Protestant nations because of their religious functions. Despite their overall demise, many characteristics of medieval European guilds persist today. Some labor unions use the apprentice/journeyman/master progression of skills and status. Labor unions today perform many of the same functions that guilds did in the past, and like guilds, seek to engage members in mutual cooperation to better the interests of the members. The study of medieval guilds in Europe provides a lens to the lives and economic system in medieval Europe, with remnants of the system still evident today. A large number of economic concepts are easily introduced when teaching about guilds. Specialization and division of labor (Standard 6 in the Voluntary National Content Standards in Economics) are easily demonstrated since workers specialized in a particular occupation, and within the occupation, workers divided the tasks to produce a good among themselves. Specialization and division of labor lead to an increase in the productivity of the workers. and through the years of practice the apprentices would go through in their quest to become masters. Human capital is an important ingredient that leads to economic growth in an economy. Of course, the monopolistic nature of guilds allows the discussion of monopoly (Standard 3). The guilds acted as monopolists by attempting to push prices higher by restricting their output. Guilds created barriers to entry by not allowing non-guild members to work in the occupation. While some rules, such as the requirement that work be done during the day, may have helped improve the quality of the product, the rule also probably made it easier to ensure no non-guild members were working in the night. Finally, throughout history, societies have created many institutions (Standard 10) to help organize their economic systems (Standard 3). Guilds are just one example of an economic institution; other examples include markets themselves as well as the development of a banking system. Because every society throughout history has developed its own economic institutions and systems, societies throughout time can be compared by how each dealt with the fundamental problem of scarcity. Steven A. Epstein, Wage Labor and Guilds in Medieval Europe (Chapel Hill, N.C.: University of North Carolina Press, 1991). 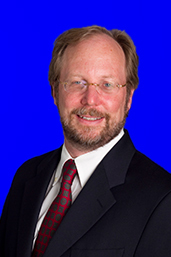 Council for Economic Education, Focus: Middle School World History (New York: Council for Economic Education, 2011), 252. “The Articles of the Heaumers and of the Hatters,” from A Source Book of London History from the Earliest Times to 1800, ed. P. Meadows (London: B. Bell and Sons, Ltd., 1914), 44-45, http://archive.org/stream/sourcebookoflond00mead#page/n5/mode/2up. Council for Economic Education, Voluntary National Content Standards in Economics (New York: Council for Economic Education, 2d edition 2010). Originally published by the National Council for the Social Studies under the terms of a Creative Commons license. This entry was posted in Economics, Economy, History, Medieval, Middle East. Bookmark the permalink.